The landscape of marketing and selling food products has changed throughout the decades from simply selling products, to a world where consumers expect to share the same values and feel a connection to brands before purchasing. Despite this drastic evolution, the mindset of connecting with consumers has always been a present value for Hormel Foods. Anyone who knows the company is familiar with the phrase, “originate, don’t imitate,” which is founder George A. Hormel’s charge to lead with a spirit of innovation. Innovation is ingrained in the company’s values and character, and has been fundamental to continued success. Perhaps one of earliest innovative marketing campaigns for the company was Jay Hormel’s idea to organize the Hormel Girls Corp. After World War II, the company was known for its ubiquitous SPAM® products, but wanted to keep the momentum and broaden the company’s image nationwide. As a result, the Hormel Girls were established, and consisted of 20 former servicewomen that later expanded to 60. Not only did this group employ female veterans after the war, but it also gave the company an important connection to their most important consumer, the housewife. The Hormel Girls in the 1950s. The Hormel Girls performed around the country and spread the word about the company and its products. They became an official sales-entertainment unit and eventually became an on-air radio show, an innovation in advertising for the time. A typical half-hour radio show would feature three commercials, but the Hormel Girls Corp could fit five well-spaced commercials plus another 15 mentions of the Hormel name between musical numbers. When they weren’t on the air, they continued to travel around the country in their white Chevrolets and were greeted with excitement in each city. Radio stations and newspapers would announce the arrival of the Hormel Girls and the crowd would often walk away with lots of purchased Hormel products. Because of the national coverage, the salesforce and sales more than doubled during this time. 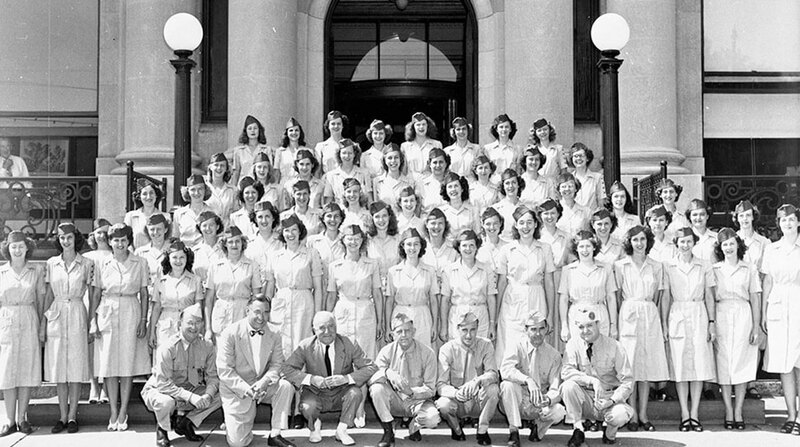 After several successful years, the emergence of TV and TV advertisements began to take over and the company refocused its advertising efforts, grateful for all of the Hormel Girls’ efforts during this time. For a lot of Hormel Foods brands, how brands communicating their messages has had to change a lot more than the products themselves in the last 125 years. Consumers today want to invest in brands that capture their attention and align with their values. The SPAM® brand, for example, has gone from wartime hero, to integral part of a Monty Python sketch and musical, to now having a SPAMERICAN™ Tour and food truck travel across the U.S. and being featured on menus at trendy restaurants and in publications like Bon Appétit. The way the SPAM® brand has advertised has evolved as well. In the early years, SPAM® products were pictured on the center of the plate. Now it’s all about how you slice it, dice it and use it as an ingredient in a recipe. Social media and mobile has forever changed what we expect from brands and consumers now have a world of information at their fingertips. With this information overload comes an incredible filter for what consumers will pay attention to. Studies claim that Americans are exposed to 4,000-10,000 advertising messages a day, so brands need to be relevant and interesting to consumers. “All of our strategies start with the consumer, understanding where they are and what they are looking for. Then it’s about finding the best ways to engage with the audience. We now need a combination of media platforms to make something successful and it’s important to constantly ask ourselves ‘why would someone care about this?’ and ‘why would they watch it?’ Being entertaining is now just as important as being informative,” said Ali Siviter, vice president and group account director, BBDO. Creative marketing tactics can be one way that brands shake up their images, and Hormel Foods brands have recently ventured into the area of experiential marketing, executing campaigns or event presence that has garnered significant attention from consumers and media for their creativity and effectiveness. 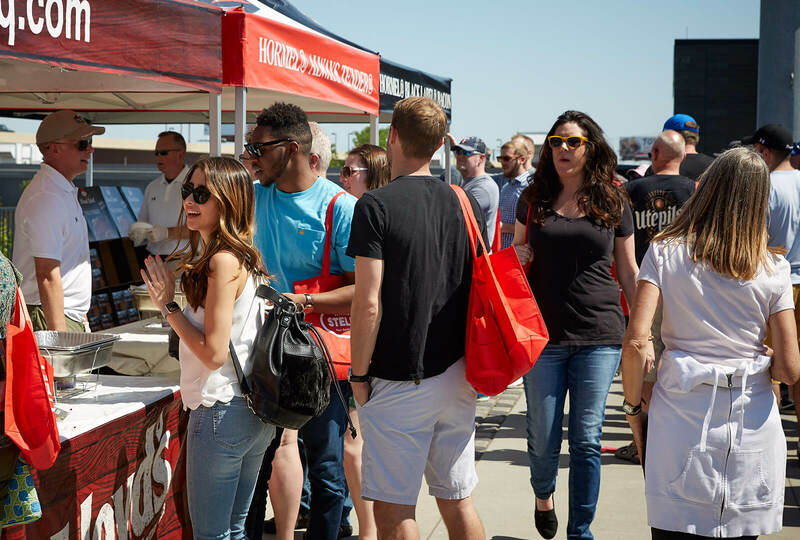 Hormel® Black Label® bacon is one brand which has executed several successful experiential marketing campaigns, but they all started with the desire for a strategic shift to build the Hormel® Black Label® brand through consumer eyes. “We wanted to connect with millennials and realized that creating experiences surrounding our brand was one place to start,” said Nick Schweitzer, Hormel® Black Label®bacon brand manager. As the bacon frenzy heated up about five years ago (when bacon-flavored-everything flooded categories from air-fresheners to soap to vodka), Hormel® Black Label®bacon realized that no other bacon brand was matching the seriousness that hard-core bacon lovers had about bacon. The brand set out to match these lovers’ passions for bacon by demonstrating how it was just as serious. “The Hormel® Black Label® brand is all about taking bacon to the next level, and looking forward, there is no shortage of ways that the brand is planning to achieve this vision,” said Paul Schmidt, vice president and group account director, BBDO. Some of the campaigns have included the Driven by Bacon campaign with the first bacon-fueled motorcycle, The Black Label® Bacon Strip Show™—a burlesque show in Las Vegas dedicated to bacon—and several partnerships and events such as the sponsorship with Epic Meal Time, various bacon festivals and the first ever International Bacon Film Festival. Throughout these events and marketing programs, the brand communicated proof points that appealed to the consumer such as being all hardwood smoked and eventually launching new premium thick cut varieties that are unique in the category. See how Black Label® bacon is pushing bacon forward at BlackLabelBacon.com. Two of the company’s brands that fall into the more natural and organic space collaborated last January to participate in Sundance Film Festival. The company’s partner, Autumn Communications, helped to execute the event and pitch to various media, garnering more than 350 million earned impressions. 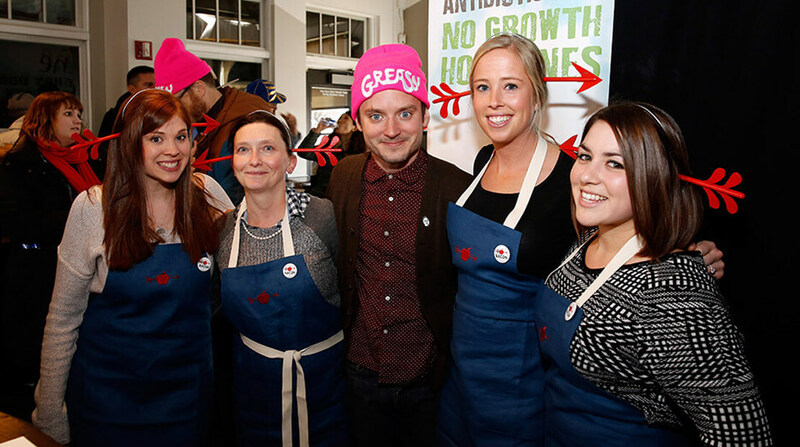 Applegate employees pose with actor Elijah Wood at the brand’s 2016 Sundance event. Applegate®and Wholly Guacamole®products were served to A-list celebrities that visited the LA Times photo studio and IMDb studio, and overall was a unique opportunity to bring two of the natural and organic brands in the Hormel Foods portfolio together for high-level exposure. Before any of these marketing campaigns take place, an important first step for brands is to make sure their product solves the right need for consumers. The Consumer Insights and Corporate Innovation team at Hormel Foods is a crucial resource for the success of the brands and products to make sure they know who their consumer is and what their needs are. They are the bridge that connects the life of the consumer with the mission of Hormel Foods. Tanya Rodriguez has the unique role of discovering consumer sentiment, face-to-face. As the cultural anthropologist for the company, she ventures into the homes of consumers to discover the stories of how they use Hormel Foods products and what they have to say about them. “Technology has made the biggest difference in how we listen to our consumers. When I started in this role, we would take photos and write down what consumers say. Now it’s not just pictures, but we video record the consumer so we have their actual voice and can hear and see how they interact and relate to a product or brand. We’re able to have much more richness for our stories and we’re working to eventually have a database of clips that brand managers can refer to in order to see their consumers and what they say,” said Tanya Rodriguez, cultural anthropologist for Hormel Foods. Perhaps the most impactful project Tanya recalls working on relates to the new Hormel Vital Cuisine®products. In partnership with the Cancer Nutrition Consortium, Tanya and the consumer insights team were turned loose in an attempt to develop a product that met the needs of cancer patients. They discovered that it’s more than just providing quality products, but having the insight to all of the challenges that come along with eating when undergoing treatment. 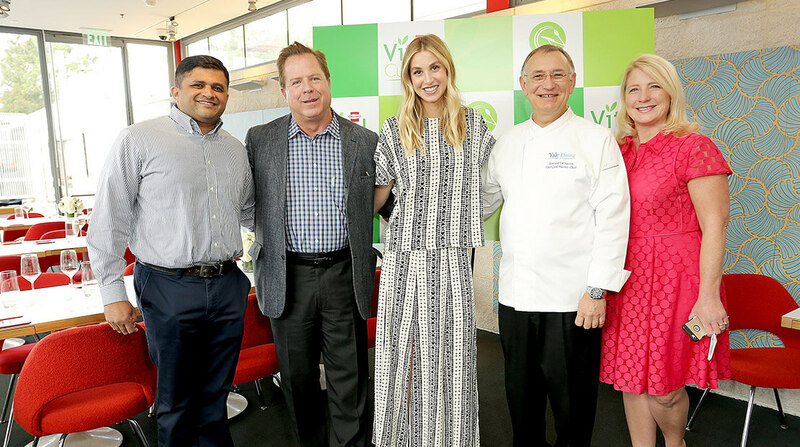 Chet Rao, Hormel Foods specialty foods division; Peter White, Cancer Nutrition Consortium; Whitney Port; Master Chef Ron DeSantis, Cancer Nutrition Consortium; Wendy Watkins, Cancer Nutrition Consortium and Hormel Foods. Following the consumer insights research done on Hormel Vital Cuisine™ products, the Specialty Foods group led a large cross-functional team to launch the products, which included operations, R&D, packaging, marketing, public relations and more. 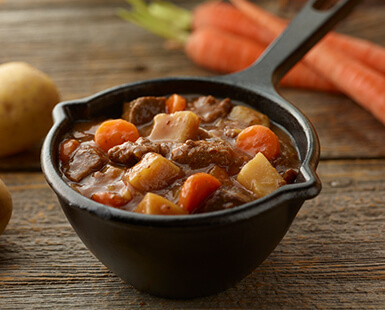 “From the beginning, Hormel Vital Cuisine™ products have always been about connecting with the consumer. The most rewarding thing is that we now have people who have used the products coming to us and offering their testimonials, which we will be using to spread the word to anyone who may be impacted in the same way,” said Dr. Chet Rao, strategy and business development manager, Specialty Foods Group. 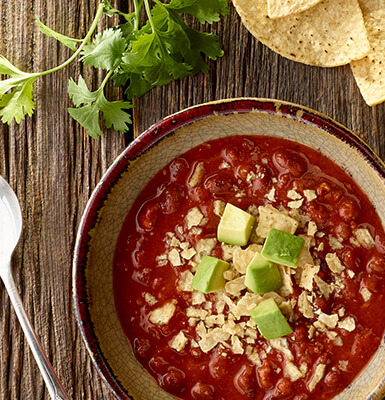 Learn more about Hormel Vital Cuisine™ products on vitalcuisine.com. As far as the future of connecting with consumers, the company continues to grow and nurture its strong brands. Hormel Foods leadership consistently references the four company growth platforms, which include multicultural, global, on-the-go and healthy/holistic foods, for evolving and positioning the portfolio for future growth. Building brands, along with innovation and acquisitions, is the formula for success that has yielded impressive company growth, driving shareholder return. “In Grocery Products, our purpose is to create tasty and simple foods that fit today’s consumers’ lifestyles. 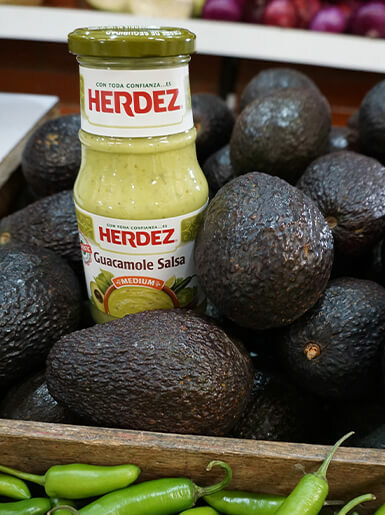 We will continue to evolve our portfolio and continue investing in our brands to maintain relevance with our consumers,” said Luis Marconi, vice president of Grocery Products marketing. 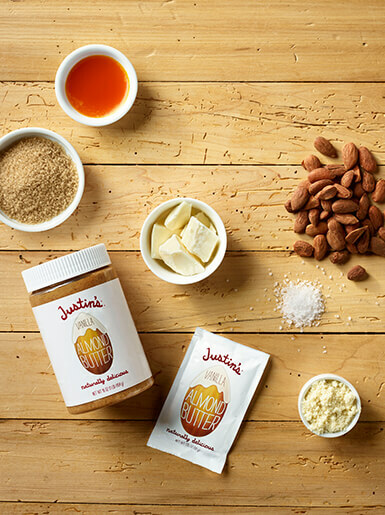 A pioneer in nut-butter based snacking, Justin’s is the company’s newest acquisition that fits within the Grocery Products division. The brand markets four successful nut-butter based snack lines – spreads, squeeze packs, peanut butter cups and snack packs. Hormel Foods was attracted to the brand because of the alignment with the SKIPPY®brand, as well as their ability to offer an on-the-go protein solution. The brand has a robust social media presence and shares a passion for innovation, quality and creating the best possible consumer experience.